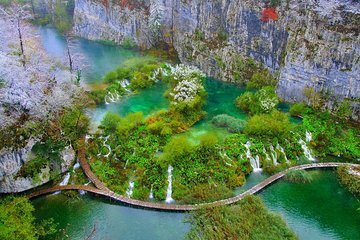 Visit Plitvice Lakes and Zadar on a full-day tour that departs from Split or Trogir. Admire views of the Adriatic as you travel to Plitvice National Park. Go on a guided walk along the wooden pathways and take in views of the lakes and waterfalls. Enjoy a boat ride on Kozjak Lake and take time to independently explore the park. Ride an electric train from Proscansko Lake to the park entrance. Continue on to the city of Zadar and stroll through the ancient city.